Everton in the Community is one of the UK’s top sporting charities and firmly established on the world stage of community sports development. As the official charity of Everton Football Club it is considered one of the Premier League’s leading community schemes due to the quality and reach of its various programmes. Since 1988 Everton in the Community has been at the forefront of social intervention across Merseyside, not afraid to tackle issues which others shied away from. Through its 120 dedicated full-time staff and 160 volunteers, the charity offers over 40 programmes covering a range of social issues including health, employability, anti-social behaviour, crime, education, dementia, poverty, youth engagement, youth justice and disability. In recent years, the charity has helped more than 1000 local unemployed people become ‘job ready’ through its ‘Everton 4 Employment’ scheme; developed a number of programmes with Mersey Care NHS Trust to tackle mental health issues among different groups within the local community and runs the biggest football programme for people with disabilities of any club in the world with 11 teams for all ages and abilities. 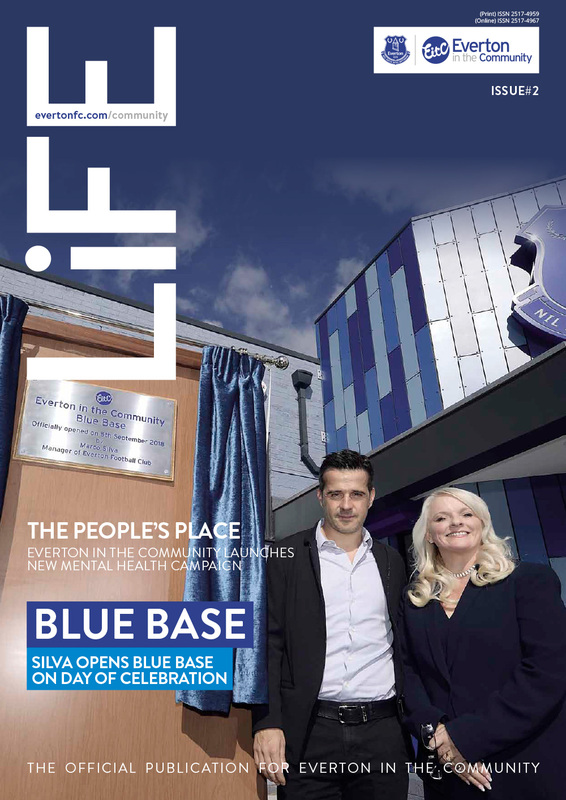 Everton in the Community has also achieved a 78 percent non re-offending rate with its Safe Hands programme which helps integrate young offenders back into society and the charity made history when it became the first associated to a Premier League football club to open a Free School, ‘Everton Free School’. In the last six years, Everton in the Community has picked up over 100 international, national and regional awards in recognition for their innovative ground-breaking work including an Outstanding Achievement Award at the StadiumBusinessAwards, a Times Higher Education Award for its work in supporting young children at risk of mental health issues and a Beyond Sport Award for its advances in tackling the stigma around mental health. The charity recently raised £240,000 to support those at risk of homelessness through its ‘Home Is Where The Heart Is’ campaign. Headed up by Everton’s David Unsworth and the Under-23 squad, the campaign has seen the charity develop a supported living initiative for 16-23-year-olds which will offer young people who have fallen on hard times, or have perhaps fallen out of the care system, a place to stay in Liverpool.